Having an estate plan is crucial for ensuring that your financial estate passes on to the people you want it to. Having a great estate plan will take into account taxes, health care, and whether you should form a trust. Even if you take all of these steps, and create good estate planning documents, you can still be missing a big estate plan key: communication. If your loved ones have no idea what kind of estate plan you have, it can still be confusing to figure out once you are gone. Having good communication is crucial to ensuring that everyone involved in an estate plan is on the same page, and knows what is going to happen and where important documents are housed. Talking about estate planning usually involves talking about uncomfortable topics, such as debilitating diseases, mental incapacity and death. Many families would rather not think about their loved ones growing old and dying, and avoid talking about it as well. As uncomfortable as it can be, communication around these topics is essential to forming a plan for the unforeseen future. Another reason that families choose not to discuss estate planning is the fear that it will cause family drama or anger over financial decisions. Maybe money will go to one relative in a greater amount than another. Or perhaps you are not including a certain family member in a living trust. All of these issues need to be handled delicately, but not avoided. Being completely transparent with your estate plan can help to get any negative feelings out in the open early so that they can be dealt with. Waiting until your death to let your family figure out what you had in mind for your finances can be hurtful and confusing. Be completely clear and have the hard talks about estate planning early. Many people know that they should have talks with their loved ones about end of life decisions, but put it off for a variety of reasons. Just being busy, being uncomfortable with the topic, or thinking you will just be gone anyway can keep people from prioritizing talking about their estate plan. If you do not communicate anything to your loved ones, they may not even know if there is an estate plan when you are gone. How will they know where the documents are, or even the name of the lawyer you have consulted with? You may have an extensive plan in place, but if your relatives don’t know where to look it can create hurt feelings and extra, unnecessary work. If there are decisions that need to be made while you are still alive regarding medical care, you need your loved ones to immediately know where important documents are, and what your wishes are. Especially with life-extending help, there is a short window of time to make various medical decisions and you don’t want to put the burden of those life and death decisions on your loved ones. Communicating your plans will eliminate all of this unneeded stress. Don’t put an emotional or financial burden on your loved ones by failing to communicate your estate plan. A successful estate plan will involve all of the relevant parties, and make sure that everyone is on board. This does not necessarily mean that everyone has to be completely happy with the way your estate plan is crafted, but they do need to be informed. Maybe you have decided to entrust decisions about your medical care to a loved one that does not feel comfortable in that role. Or perhaps a family member has valuable insight into how your plan could be crafted in a more beneficial way. Discussing your estate plan will ensure that your loved ones are aware that you have made a plan for the future. Opening up the lines of communication is important, but you can go a step further by having ongoing and consistent discussions regarding the future of the plan. Estate Plans are not fixed and can change over time due to financial and medical reasons. Having an open line of communication regarding your estate plan ensures that as it changes, the relevant parties are kept in the loop. Open communication is good in any family, and hopefully the deeper topics touched on during estate planning will pave the way for deeper relationships. The way you plan for when you are gone says a lot about your philosophy on life, and open communication can help convey your beliefs and life stories to those you love. Continually revisiting your estate plan is the best way to effectively communicate your wishes. If you are hesitant to talk to your loved ones about your estate plan, having your estate planning lawyer present can help. A lawyer can answer deeper legal questions that your family members may pose, and can help everyone understand the implications various estate plan choices have. Knowing the lawyer that you have worked with also assists your loved ones in knowing who to reach out to in the event they cannot locate documents or have questions. Having an impartial third party present can also help to diffuse any over emotional sentiments regarding an estate and help to keep the discussions calm. 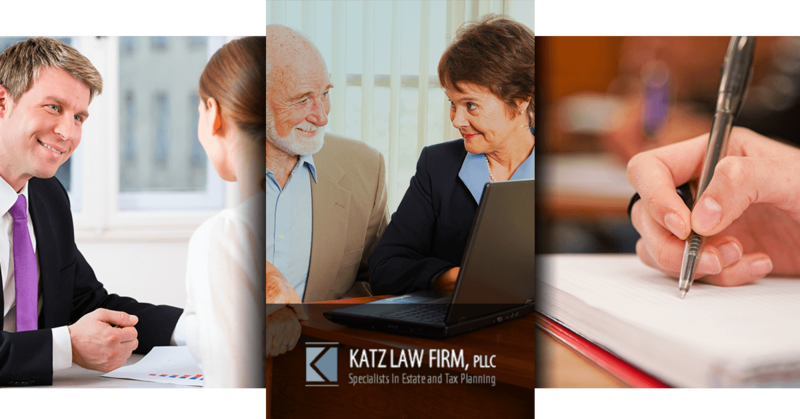 If you would like an experienced lawyer to assist you in talking to your family members about your estate plan, Katz Law Firm is here to serve you. We can untangle complex legal situations and answer all of your loved one’s questions. Having a detailed plan in place, having a lawyer meet with your family, and talking about the hard issues are all great steps towards a sound estate plan that will be easy for your loved ones to execute. You should still write out important phone numbers, locations of documents, and any relevant email or online password information. Imagine being gone tomorrow and your family trying to access all of the information that you currently keep indexed in your mind. Even not being able to log into an online account can create a whole host of problems. Write out all of the important information you can think of, including locations of documents, and give to all relevant parties to keep in a safe place. As you can see, as important as estate planning is, communication is just as essential. Make sure that your estate plan is carried out as you envisioned it by talking with your family members early on, before they need to make any decisions for you. If you are in Cedarhurst, Katz Law Firm can help you will all of your estate planning—including communication! Contact us today to schedule an estate planning appointment.